The only words I needed to hear to peak my interest in The Keeping Room were "revisionist female western" but then they added Brit Marling and Hailee Steinfeld to completely seal the deal. Directed by Daniel Barber from a script by Julia Hart, the story unfolds in the last days of the Civil War. Marling and Steinfeld play sisters who, along with their slave, played by Muna Otaru, must defend their home and themselves from rogue soldiers, led by Sam Worthington, who have broken off from the Union Army and are making their way across the land, stealing and pillaging as they go. It's no surprise the trailer for The Keeping Room looks spectacular. Not only does it showcase a number of talented actors, Marling in particular looks on point, but the movie is shot by German cinematographer Martin Ruhe who in the past shot Anton Corbijn's gorgeous features Control and The American. 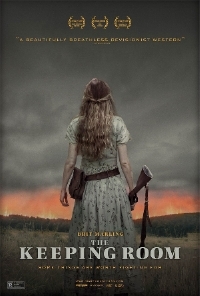 The Keeping Room opens September 25.